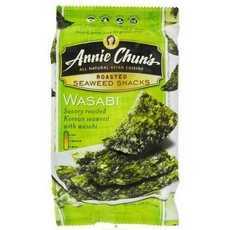 shop Annie Chun s Seaweed Snack Wasabi 12x0.35Oz | bargainbrute. Enjoy Annie Chun's Seaweed Snack Wasabi. Here?S Your Chance To Discover A Delicious New Snack That?S Bursting With Flavor And Chock-Full Of Vitamins And Minerals To Keep You Going All Day Long. Our Korean Seaweed Is Roasted To Perfection And Then Seasoned With A Dash Of Salt, Sesame Seed Oil, And Wasabi Powder Creating A Savory Taste Sensation That Promises To Excite Your Palate. Go Ahead. Indulge. Your Friends Will Have Culture Envy. Order Annie Chun?S Wasabi Seaweed Snacks Today And Enjoy A Unique, Healthy Snack! (Note: Description is informational only. Please refer to ingredients label on product prior to use and address any health questions to your Health Professional prior to use.